Facebook, Twitter, Youtube, oh my! Nobody should have to keep up with it all. Some people look at Twitter, some people are just on Facebook, some just text, some use YouTube, some only talk face to face. But they all want to know when you’re playing. How do you get the word to all these places without having to update each thing individually? If I put a video up on YouTube, I’d like to alert the FB and Twitter, but not duplicate. If I put a new song on Soundcloud, I’d like people on my Twitter and FB to know that it’s there, but not have to update each individually. There are a lot of services that want to help you with it, but nobody does it all; you really just have to set it up yourself. This is not advocating farming out your twitter! Like I said, this is just designed to make it easier to keep up with it all, it’s not supposed to take the place of real human interaction, etc. There are some who would say that the auto updates make your profile look spammy. I don’t have access to FB and Twitter during the day, so it’s nice to be able to let Artistdata do it for me. There is a certain amount of balance to consider. The automation is mostly for the little stuff – like blog updates, shows added, new songs added, new videos, etc. Just stuff I wouldn’t want o have to repost everywhere. Basically, have it all feed into Twitter, then have Twitter feed everything else, so it doesn’t get duplicated. Notice you can still add stuff to your Soundcloud, or Tumblr, or Myspace, or FB, and then it will all automatically go to everywhere else. Personally I would like to be able to update my FB but not have that go to Twitter. 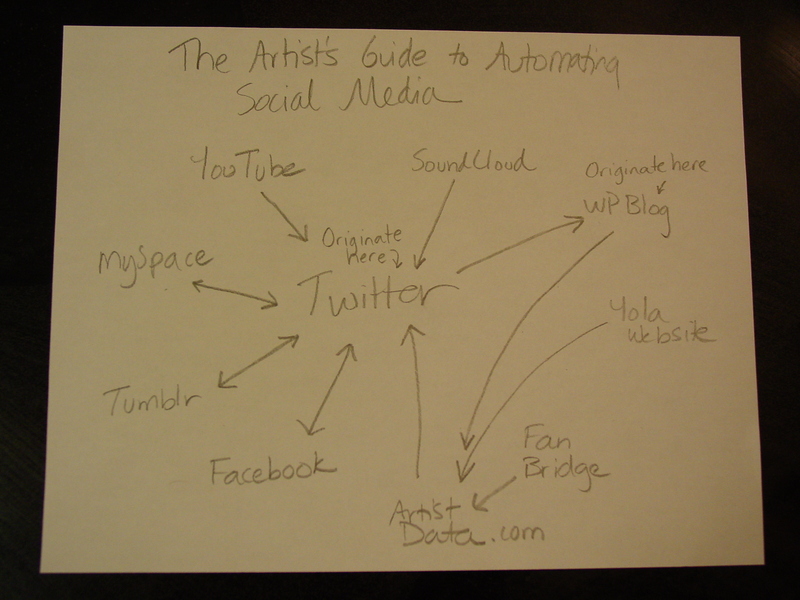 FB is personal, Twitter is more industry oriented. You just have to go into the settings for each service to do this. You can update all your social networks at once with this. However, it’s not really geared toward musicians. No soundcloud, artistdata, reverbnation, etc. So I still recommend going the old fashioned way and having it all go through Twitter. What do you think? Comment below! How do you manage your social media? 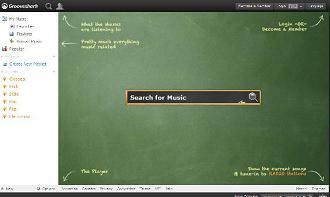 You can search Rdio, Spotify, Grooveshark, Spotify, Mog, and Bandcamp all at once. 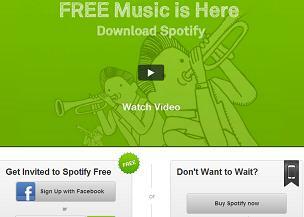 Spotify, Mog, Rhapsody, Rdio, Grooveshark – they’re all fantastic services, but which one is best? Personally, and this may sound a little demanding, but I’d like to be able to take all my songs, upload them into a cloud, be able to listen on unlimited computers and devices, and also have access to all 11 million other songs to integrate into my playlists. 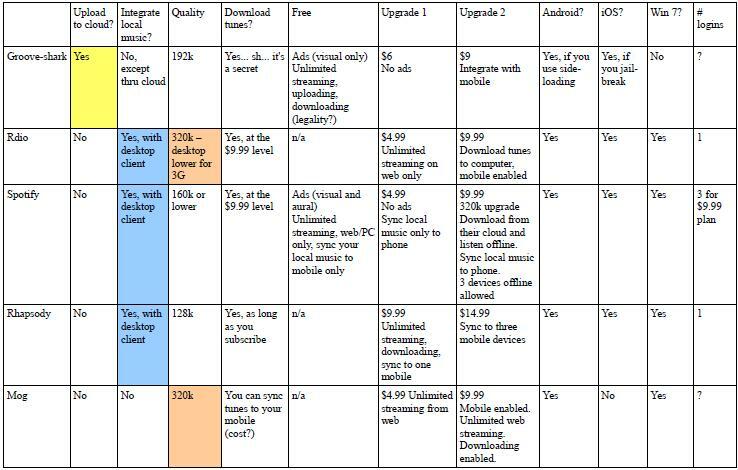 Oh, and I’d like to download to listen offline as well, for a low to moderate monthly price. So… does this exist in the legal world? I went on a quest to determine which was the best music access service, and here’s what I found out. First of all, Grooveshark seems to be the ideal way to integrate everything, but they are currently battling a lot of legal issues right now. 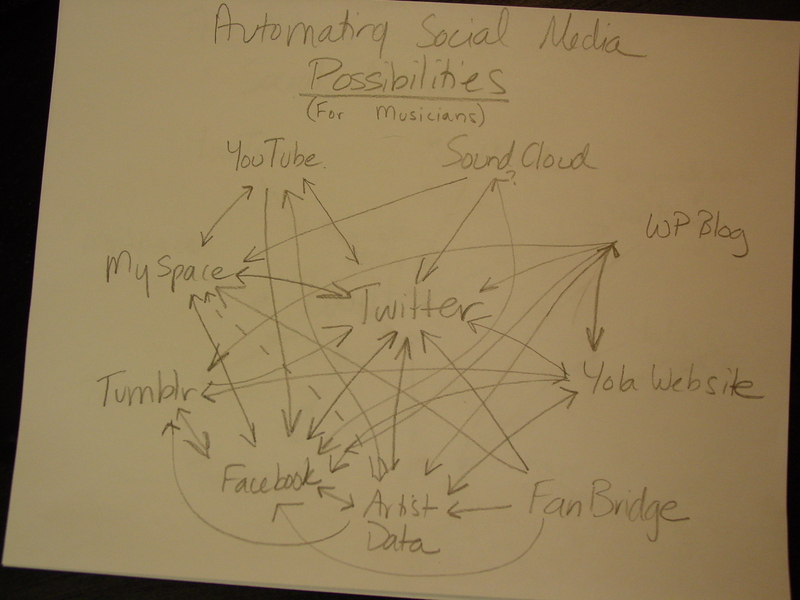 You can upload your music into their cloud, but get this – it then becomes available to the entire world! This could be really great, in that an undiscovered artist could get some exposure without having to go through Tunecore or iTunes. But at the same time, you can imagine the RIAA and record labels are not liking this. They also just came out with a way to download as well, called Groovejaar. They way they justify the legality is by making it possible for artists and labels to request their music to be off the service. It’s basically like YouTube for mp3s. 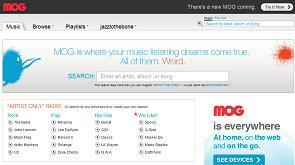 After Grooveshark, my personal favorite for streaming only is Mog. The quality of the music, and ability to look at tons of playlists and see what other people are playing is fantastic. Unfortunately there is no integration of your own music, so if you want to hear something that’s off their cloud, you have to go into a different application. That’s where Spotify, Rhapsody, and Rdio come in. While the quality isn’t as great, (Spotify is 160k, Rhapsody is 128k, and Rdio is 320k desktop and lower with 3G) the ability to sync your own music with their library through a desktop app is pretty cool. The Both Spotify and Rhapsody allow you to integrate your own songs with theirs in your playlists. They all allow downloading at the $9.99 level. So then it becomes a matter of library, sharing, and number of devices. From what I’ve looked at, the Rhapsody library is the biggest. This is why I subscribe. However, Rdio and Spotify trump Rhapsody for the sharing/discovery aspect. Spotify allows three devices offline at the $9.99 level. Rhapsody is pretty strict with the number of logins – they only allow one login at a time, and only one mobile device sync. If Rhapsody would allow me to upload all my tunes to their cloud, I would definitely stick to them, as they have improved their mobile app and flaky service. However, I’m still looking… I just wish Mog would create a desktop app, and then allow you to upload your music to their cloud. Then it would be perfect. I’d definitely pay $9.99 per month for that. It would save me money in the long run because I wouldn’t need to have so many GB on my mobile. So, what services did I miss? Leave a comment below! Check out the chart I made which compares everything! Let’s say you want to create an completely interactive website, with places for people to review your music and leave comments. Well, WordPress is an awesome way to create a website, and their plugins make this all possible. This post is a brief review of the wordpress plugin: WP-Customer-Reviews. The plugin is easy to install, easy to use, and sets up a great looking little review bar for your fans to review your music. Only problem is, when you insert it into a page, you can’t control the fact that whenever someone lands on that page, it immediately jumps to the review bar. So you basically have to create a page just for reviews, and have nothing on that page; otherwise it creates a weird shift. So that’s it. Great setup for a brand or business, but not really applicable for musicians, if you want people to see music/merch/etc. on the same page, etc.